(TibetanReview.net, Feb22’16) – Although the total number of political prisoners in Chinese ruled Tibet could not be estimated, available information show that at least 2081 are still in jail, including 967 monk and nuns, said Dharamshala-based Tibetan Centre for Human Rights and Democracy in its 2015 annual report released on Feb 19. The centre said 68 of them were jailed in 2015. The report, “human rights situation in Tibet”, published in Tibetan, Chinese and English, accuses China of using laws such as those on national security and counterterrorism to justify its oppression and rights violations in Tibet. It also says China “prioritized rhetoric over substance” when it came to the question of respecting Tibetan people’s human rights. The report says China used “mass surveillance” laws and policies to especially target religious figures as well as community leaders. 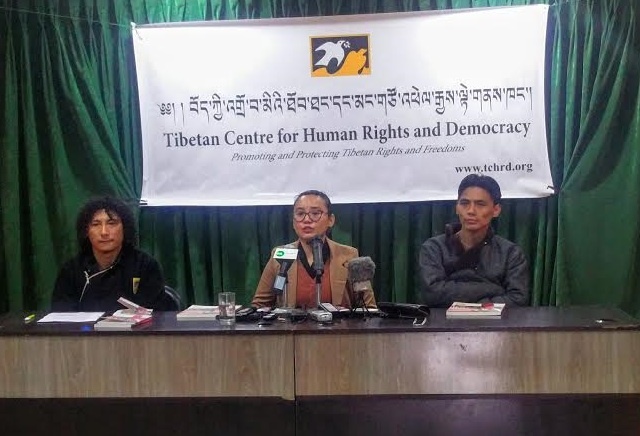 According to the Centre’s director Ms Tsering Tsomo, whereas 12 Tibetan had self-immolated in the last four months of 2014, the number in 2015 was 9. “The reduction in the numbers can be attributed to ruthless measures such as criminalizing the peaceful act and punishing the families and friends of self immolators,” She said. The report also accuses China of being profuse in making pledges, such as on addressing climate change issues, it does not keep. The 194-page report covers issues of religious freedom, civil and political rights and the environmental degradation of Tibet due to China’s reckless exploitation of its resources.